Gift cards are the most popular gift. Customers love them. So do businesses. Here’s why: They look great in the store, branded with your company logo. They take up little room, leaving your precious retail real estate free for product. Most gift cards aren’t redeemed right away. This allows you to bank the cash and collect interest or use it for other operations. Many gift cards are never completely used, leaving a balance for you to claim as profit. Loyalty Gator offers a gift card program for small, medium and large businesses. The best part about the gift card program is we have NO transaction fees! This alone can save bigger businesses tens or hundreds of thousands of dollars every year! Work with our partners and get a custom design for your own branded gift cards with a look that's unique to your business. Our gift card programs allow you to encourage customers to register online, allowing you to collect more valuable information about your customers. Plus, our gift cards are reloadable! Connect multiple merchants to a single gift card program. Coalitions are generally geared towards shopping centers and franchises. Find out more about our coalition gift card program here. Check out our ultra competitive rewards programs and gift card pricing. Special packages are available for multiple locations to create a customer gift card program unique to your organization. 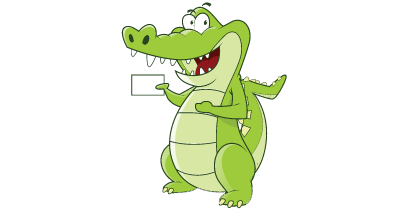 Loyalty Gator makes it affordable to have your own gift card program. Our low monthly pricing comes packed with lots of great features and no transaction fees!